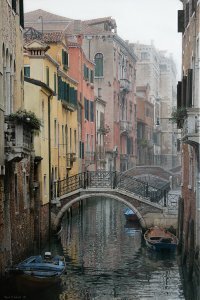 While in Venice, Chase spent many hours photographing the Grand Canal and also the smaller, inner canals. Many of his photos were taken at twilight or dusk, but on several mornings he and his wife rose arose early to enjoy a “different” Venice - few tourists and no gondoliers or boats traffic. The city was totally still and quiet except for the sounds of water lapping against the timeworn bricks or the hulls of tethered boats. The mists of morning mad the canals all but vanish. As dramatic and awe-aspiring as Venice was in the evening, it was even more remarkable in the morning - a magical moment when the city seemed invisible except for the soft colors of the ancient buildings reflecting in the water. It was a world of delicate hues and magnificent lectures - so real up close, then silently disappearing like a dream in the silvery mists of morning.